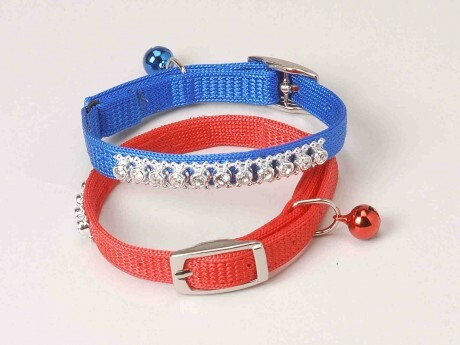 Cat Collar, Nylon Snag-Proof Safety Cat Collar with Bling Bling Rhinestone and Bell-3/8"-Hi-Light International Inc.
3/8" width for neck size: 8",10",12"
Different webbing colors are all available. Sang-Proof Nylon Webbing for pet collar. Elastic Loop for Safety Feature. Fixed Length with 6 buckle holes for best fit for your cat.